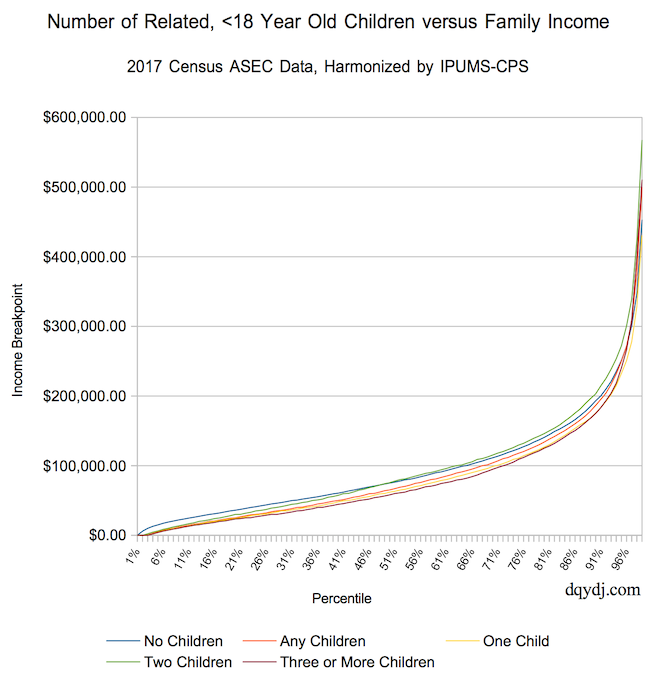 On this page is a Households with Children Income Percentile Calculator for the United States in 2017. Family households with children include a head of household with related children under the age of 18. Data originates from the 2017 ASEC and income is family income for full-year 2016. The methodology and definition discussion continues below the tool. Also here on DQYDJ: an aggregate family household income calculator. Also, we have individual income by age and an individual income calculator. Switching to net worth, try the net worth percentile by age calculator and the net worth bracket calculator. Note: the Households with Children Income Percentile Calculator starts with a logarithmic scale, which you can adjust. We first screen for only related children under the age of 18, not including the head of household or spouse. Note that this includes a head of household with grandchildren present, but does not include households with only foster children under 18. It also only includes emancipated households with a head under 18 years old if the head also has a related child. Finally, we divided the results into the categories you see in the tool. There are a few variables we could choose on the income side, but family income is directly comparable to poverty measures and we felt it best. It also conveniently sidesteps counting the income of boarders, renters, and roommates. If you’d like to use a different variable such as total household income, the microdata can be downloaded here. As a curious author with 2 young children of my own, this was a fascinating topic to chase. As you’d expect, there’s a difference in the income characteristics of families with different numbers of children. Anticipating your questions, we did both a binary kids/no kids breakdown, as well as breakdowns for one, two, and three or more children under 18 years old. This should roughly cover most of your household types, and give you a solid benchmark for comparison with your own situation. The above chart is, to put it lightly… not too informative. 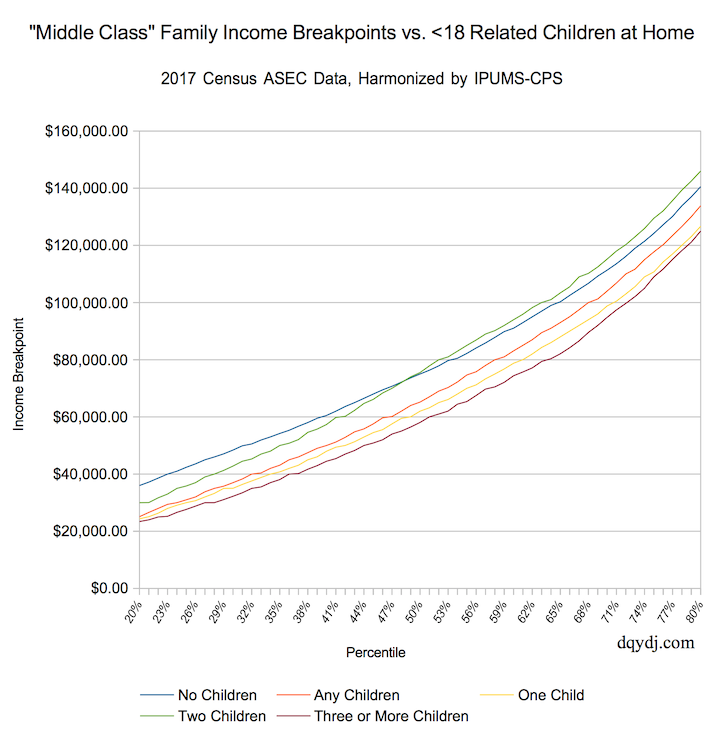 The most interesting feature of the chart is between the 48th and 49th percentile where the income breakpoint for family households with two children starts to dominate. Be careful not to draw too many conclusions here – many households with no children under 18 once had some. Still, it’s tough to say why the income distribution looks like it does. You could have easily expected retired, empty nest family households to dominate the breakpoints… we certainly did. Also, remember that the data presented is a snapshot and is not from a longitudinal study. Household composition is accurate for March 2017, and it’s impossible to say if having children leads income or households with more income have two (?) children. As you can see, there’s a lot of movement between the relative ordering of income breakpoints throughout the curve. At the very top, for the one-percent households you see something even more interesting… more kids, higher income. This data is very interesting to compare with both the generic household income calculator and the recent family household income calculator. While dividing households into these specific categories, we’ve found some very interesting data around family income. Hope you enjoyed the households with children income percentile calculator – and hopefully these finer slices are helping you get a better idea of income distribution in America. See anything interesting in the tool we missed?